Alpinists, ski mountaineers, ice climbers, mixed climbers and high-country trekkers all need an ice axe. Choosing the best ice axe for you is based on your size and activity, plus a comparison of the length, weight, shape and CEN rating of the axe. First need a basic understanding of its components. Head: The head is comprised of the pick, adze and the carabiner hole and is usually made of a steel alloy. In tools specialized for steep ice and mixed rock-and-ice climbing, the adze is rarely used and can be replaced with a hammer. This weight savings can be a real plus. 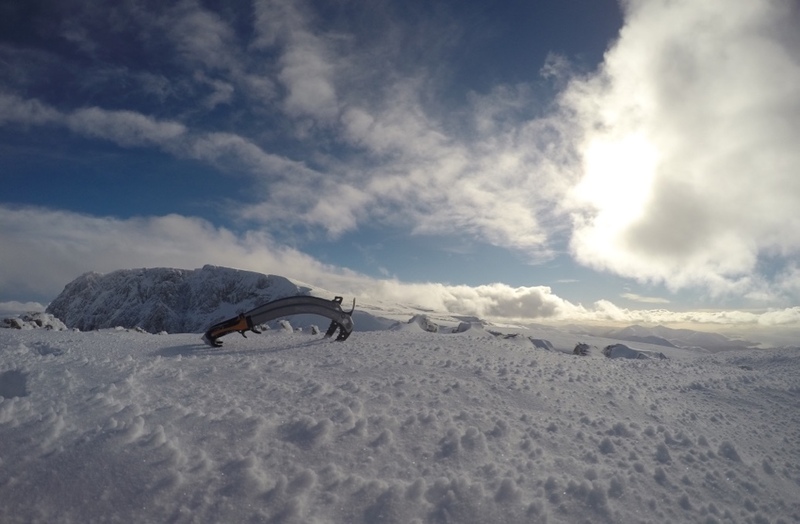 Pick: This is the sharp end of the ice axe, used for hooking and swinging into snow or ice. It is also the part of the axe used during a self-arrest. A pick is described by its curvature angle and its clearance. The curvature angle is the angle of pick relative to the shaft of the tool. A 65° to 70° angle is typical of mountaineering axes whereas a more acute angle of 55° to 60° is common to technical axes and tools. The clearance of a pick can be either positive or negative. This is determined by comparing the angle of the pick tip to the shaft. These days, the reality is that clearance makes little difference since 1) most picks are positive clearance, and 2) both positive- and negative-angle picks will penetrate snow. Adze: The broad, shovel-like adze is predominately used to cut steps or seats in snow or ice. It serves as a comfortable grip platform while hiking with the axe in a self-belay grasp (with the pick facing forward). This is the reverse position from the self-arrest grasp (when the adze is facing forward), which readies you to perform a self-arrest if you lose your footing on a steep slope. Carabiner hole: This hole in the head of an ice axe is used to affix an ice-axe leash or sometimes to clip a carabiner. Shaft: These are made of aluminum, carbon fiber or steel. Each offers a tradeoff in terms of weight and strength. Heavier shafts are usually stronger, although lightweight materials such as carbon fiber are extremely strong (but more expensive). Straight shafts are better for plunging, self-belaying or for use in an anchor. Straight-shafted axes are best for general mountaineering. Curved shafts resemble a small arc and are better designed for swinging into ice. Curved tools are best for technical mountaineering and ice climbing. Some shafts are covered either partially or wholly in rubber to provide extra grip. Athletic tape can be used to create a grip on an axe or you can wear gloves with rubber palms to create extra friction. Ice axes are measured in centimeters. Each size reflects the distance from the tip of the axe to the top of the head. Typically, axes are available in size increments of 5cm from 50cm to 75cm. The correct length is based on your size and your type of activity. This also plays a large role in choosing the right length. Axes less than 60cm are often considered technical ice-climbing tools. Since these tools are shorter, they do not offer much leverage and are poorly designed for self-arrest. Conversely, tools over 70cm are too long for technical snow or ice climbing but excel on lower-angle terrain. These longer axes are predominantly used for cross-country travel, scrambling, or building snow anchors. Note: A too-long ice axe makes self-arrest difficult as the spike can catch in the snow and send you and your axe flying. Finding a balance of the above 2 factors is usually best. If you plan on spending more time on lower-angle terrain, go with a slightly longer ice axe. If you plan on spending more time on steeper terrain (e.g., couloirs, technical mountaineering) go with a slightly shorter axe. Or, bring a shorter ice axe for the steep stuff and use your trekking poles for low-angle travel. The included chart can be used as a rough guide for choosing ice-axe length. The old saying that “light is right” should not be taken too literally when choosing an axe. Lightweight aluminum ice axes are perfect choices for applications such as ski mountaineering, trekking and glacier travel since they help you save weight and increase speed. 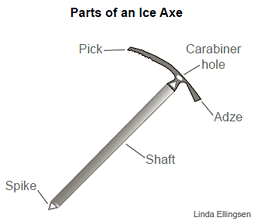 But lightweight axes tend to be less durable and less able to penetrate hard ice than heavier axes. Alloys and stainless-steel axes are heavier, but they are more durable and thus better suited for general mountaineering, couloir climbing, ice and mixed climbing. The CEN certification can help you choose the correct ice axe. CEN (Comité Européen de Normalisation) is a European group that develops and maintains equipment standards. On an ice axe, look for a circular CEN stamp that will have either a capital B or T in it. General mountaineering axes are designated with a B (basic) stamp. These are generally lighter, less expensive and less durable. Basic axes are NOT strong enough for technical climbing! Technical ice axes and ice tools are designated with a T (technical) stamp. These are generally heavier, more expensive and more durable. Note: On technical ice tools, picks and shafts are rated separately. It is actually quite common to have a CEN-T shaft with a CEN-B pick. A CEN-B pick is thinner and more flexible, penetrating pure ice better; a CEN-T pick is thicker and stiffer and works better for mixed climbing.